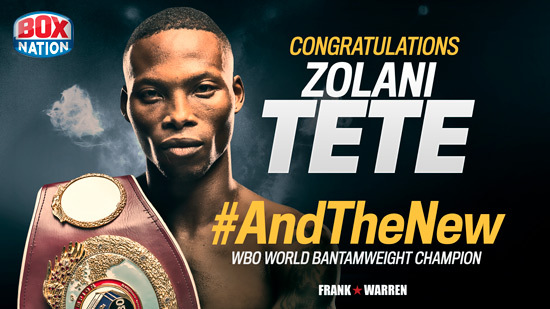 South Africa’s Zolani Tete was this evening confirmed as the new WBO World Bantamweight Champion. Tete oozed class over 12 rounds on his way to an emphatic points win over Filipino Arthur Villanueva on Saturday’s action-packed ‘City of Champions’ card at Leicester Arena, broadcast live on BoxNation. After 12 rounds, and dropping Villanueva in the eleventh, Tete was declared the unanimous points winner with scores of 120-107 and 119-108 (twice).